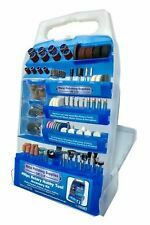 Case doubles up as an on-the-move carry case, fixed wall unit or free stands on a work bench. 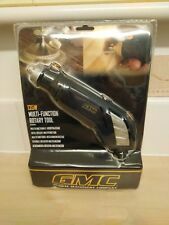 GMC DEC003AC Multi Function Rotary Tool Features. 1 x Rotary Mini Multi Tool. Spindle Lock Button - Allows quick and easy accessory changes. Spindle Lock Yes. 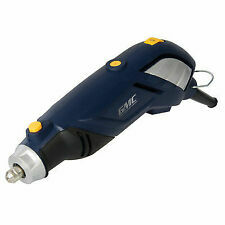 Variable Speed, 15,000 to 35,000 RPM - For a quality finish in all materials. 135W motor, with variable speed 15,000 to 35,000rpm, for versatility and a quality finish in all materials. Ergonomic and compact design for easy access in confined areas and greater comfort over long periods of use. 135W motor, with variable speed 15,000 to 35,000rpm, for versatility and a quality finish in all materials. - Ergonomic and compact design for easy access in confined areas and greater comfort over long periods of use. 135W Motor, With Variable Speed 15,000 To 35,000rpm, For Versatility And A Quality Finish In All Materials. Spindle Lock Button Allows Quick And Easy Accessory Changes. Ergonomic And Compact Design For Easy Access In Confined Areas And Greater Comfort Over Long Periods Of Use. 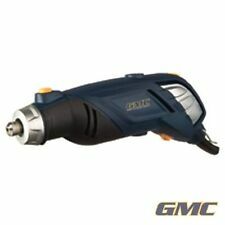 GMC 135W ROTARY MULTI FUNTION TOOL - 920154. Condition is New. Dispatched with Royal Mail Signed For® 2nd Class.